Posted on March 7, 2013 at 5:53 pm. Are you wondering about how to become an actor? Acting lessons are a crucial starting point. Almost no-one makes it without training and you need to think carefully about the type of training that will help you most. If you don’t do this, you’re making one of the top five biggest mistakes people make when trying to figure out how to become an actor. Never rely on talent. What we see as ‘talent’ is the result of hard work and skilful technique. Robert De Niro and Meryl Streep didn’t get to the top of their game by being complacent about their innate abilities. The reality is that our greatest actors have worked on developing their skills and exploring techniques that allow them to produce memorable, moving acting. Luck, innate inability and inspiration from above play little or no part in acting excellence and success. Never confuse acting with pretending. Faking it is death to your acting – and your career. The secret of how to become an actor is to understand the difference between natural acting that conveys authentic emotion and forced acting that is about pretence. Don’t fool yourself into believing that acting is about becoming your character. You can never be anyone but you – and do you really think you can ‘become’ Joan of Arc, or the Godfather? Acting is about using your own resources and experiences to explore and create a 3D character. It’s not pretending, but it’s not shape-shifting either. Shakespeare’s Hamlet famously said ‘the play’s the thing’. The reality of acting is that while the play (or TV or film performance) is the goal, it’s only a part of what an actor does. In fact, acting is a constant learning experience: from acting lessons to learning lines, perfecting accents, auditioning, rehearsing and finding the next role to pay the bills. Don’t let dreams of glory blind you to the never-ending hard graft and intelligent planning ahead that an acting career demands. Don’t give up. Acting isn’t a career where you graduate, get a job and everything is rosy. There’ll always be some setbacks and spells of ‘resting’ (unemployment, in other words) until you’re established. Unswerving commitment is a key trait that successful actors all have. These are things not to do. But there are plenty of proactive things to do when you’re contemplating how to become an actor. Method acting lessons are designed to help you avoid these key mistakes and cultivate the skills you need to do the opposite. Method acting lessons rest on the premise that you can learn the techniques and grow your ability – if you have the commitment and tenacity. Method actors use techniques and exercises to help them create believable acting that radiates genuine feeling, on cue, every time. 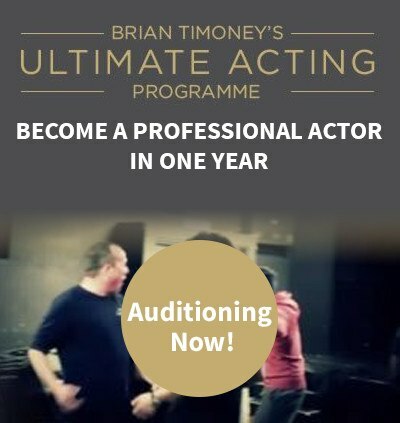 This is the goal of acting lessons at Brian Timoney Actors’ Studio, an acting school in London. The Studio’s acting lessons teach students essential, practical techniques for character creation, rehearsal and performance, as well as auditions. We also help students to plan, manage and launch themselves on an acting career. If you’re looking for an acting school in London, and want to avoid the mistakes that unsuccessful actors make, our Method acting training ticks all the right boxes.